On May 7, John Kerry met with Saudi officials in Riyadh. A so-called proposed 5-day humanitarian ceasefire is phony. Terror-bombing continues. US/Saudi enforced blockade prevents enough essentials to life from entering Yemen. Suggesting a limited pause in fighting is willful deception. Washington wants all-out terror war against 25 million Yemenis. Is large-scale invasion planned? Yemeni UN envoy Khaled Alyemany representing the illegitimate (US-installed) ousted government has called for intervention by foreign ground forces. “What we need is a speedy resumption of negotiations under the mediation of the United Nations,” he stressed. “We have come here…to call for the UN Secretary-General to put an end to this genocide war against the Yemenis. Many patients die at the hospitals because of” no fuel or medical supplies. Thousands have died, mostly noncombatant civilians either in harm’s way or deliberately targeted. Thousands more were injured, many maimed for life. Hundreds of thousands have been displaced. “The formula has changed after Saudi towns and civilians” were shelled. AP said Houthis and allied forces consolidated control over most of Aden while Kerry was in Riyadh. 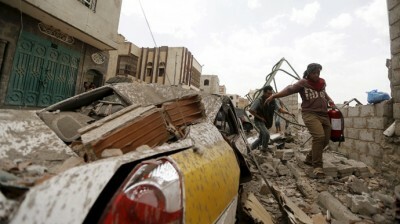 The previous day they “overwhelmed” Tawahi’s downtown district and an area presidential palace. Reuters reported Riyadh’s vow to hit Houthis hard despite a 5-day ceasefire offer. Asseri declined to say if ground invasion is coming. All options are open, he stressed. In a letter to UN officials, Houthis called for international action against Saudi-led aggression. Senior Houthi official Tawfiq al-Himyary denounced Riyadh’s phony ceasefire offer – calling it “cover” for its failures.